Hi, friends! 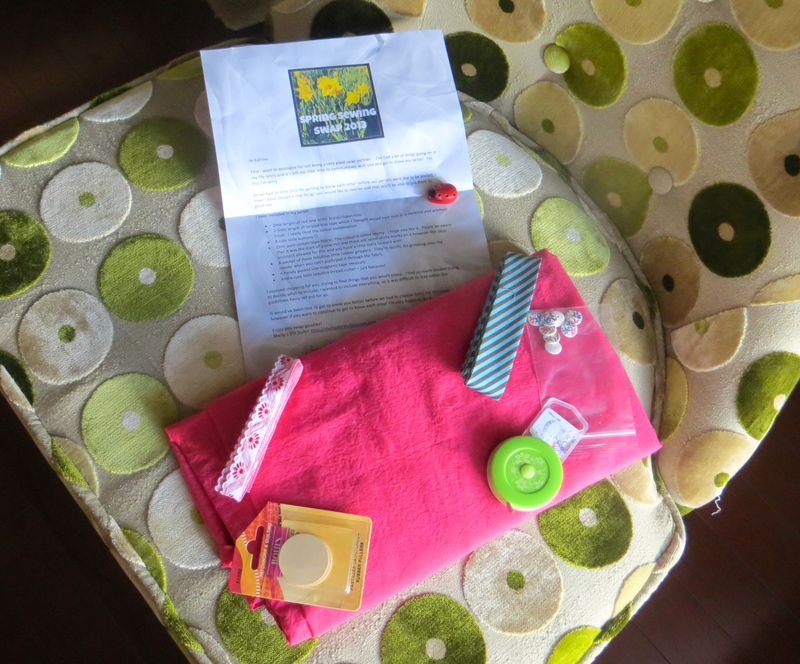 As usual, I am a bit behind on posting things — my lovely parcel from the Spring Sewing Swap is no exception, considering that it is now officially summer! Early last week I had the fun of receiving a nice little package all the way from Australia — from my new sewing friend Shelly at Shelly’s D.I.Y. Style. 2. An adorable set of flower print buttons (perhaps to go with said top?). 3. Some needle gripper pads. I have never seen these before but I will definitely love using them — I can see them saving me a lot of headache! 4. A new retractable measuring tape. Shelly must have a spy in my sewing room because I just broke my favorite retractable tape and have looked at a new one every time I go to the store but haven’t bought one. It’s a good thing because the one Shelly sent is so much better than what I’ve seen around here. 5. Aqua and brown bias tape. I love print bias tape and this one has such a soft and supple hand I can’t wait to find a project to incorporate it into. 6. Red and white trim. Red is one of my favorite colors so I know this will be easy to use. 7. And last but not least, that cute little ladybug you see is a darling thread cutter that can be stuck onto my sewing machine. How adorable is that?? Thanks so much, Shelly, for sending me my lovely treats — I am so excited about giving them all a good home. And thanks to Kerry at Kestrel Makes for organizing this swap. 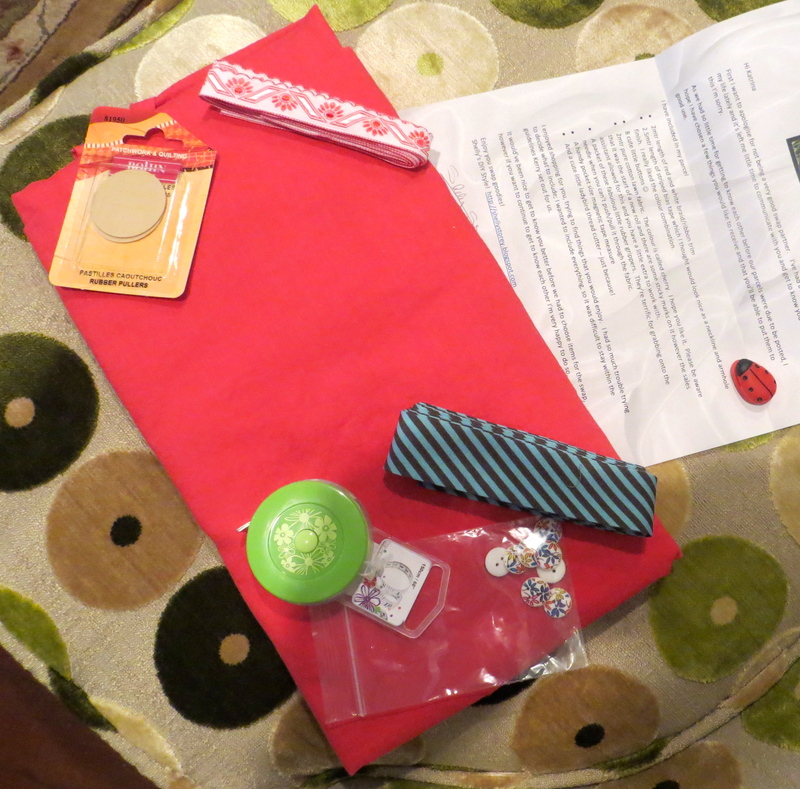 It’s so nice to receive a sewing-related gift from someone who knows about sewing. I look forward to doing it again soon! What a neat idea! I love the stationary you used for Shelly’s package, too! Thanks, Lauren! I found the stationary on Etsy. I have been loving all your blog posts even though I haven’t been able to leave comments. Would love to sew together soon (either in person or virtually)! What a thoughtful package, and I’m delighted that you had a lot in common too. I love the buttons and bias and am a big fan of retractable tape measures too – so useful! I always have one in my bag. I’m glad you liked what I sent. Like you, I found it easy and hard to shop for the same reasons, however just had to keep reminding myself of the rules Kerry had set and the deadline date or I would have just kept shopping 🙂 Thanks for swapping with me – it was fun.